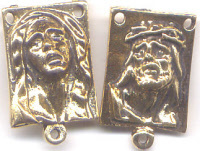 If you stood at the foot of the cross, these would be the 2 faces you saw. A St. Joseph's exclusive! Made of hard, lead-free pewter in the USA.